On July 2, workers at the Sunflower Hills Golf Course in Bonner Springs, Kansas (just outside Kansas City) called police to report a theft. Actually, 4,800 thefts. The night before, someone had broken into the driving range and stolen approximately 4,800 golf balls. Tire tracks on the range suggested that the thief loaded his treasure into a pickup truck to make his getaway. Exactly what he (and you know this was a "he") intended to do with 4,800 golf balls remains a mystery. It seems like a lot of trouble to go to for a mere prank; the course’s golf pro estimated that it would have taken someone "hours" to pick up that many golf balls. And who better than a golf pro to make that kind of an estimate? Well, me, that’s who. Assuming that the thief can fit three golf balls in each hand, that he has two hands, and that it takes him eight seconds to throw each double handful into the bed of his pickup and go back for another (I’m including in that some time necessary to move around, since the balls would have been randomly scattered over the driving range), I calculate that he could have loaded all 4800 balls into his truck in less than two hours (106 minutes, to be exact). And that doesn’t even take into account the likelihood that he was high on meth or had a shovel or a friend. So I think the golf pro is off base on the time estimate. He is right, though, to think they could have used a pickup truck. Another set of calculations that I really don’t have time to be doing, especially complicated ones like these that involve the 400-year-old Kepler Conjecture, pi, and the specs for the cargo bed of a pickup truck, seem to show that while 4,800 balls sounds like a lot of balls, they would easily fit into the bed of, say, a Ford F-150 Supercrew, which could actually hold about 33,500 (depending on how you pack them). Still, what do you do with 4800 golf balls once you sober up and/or the humor value of having them has worn off? Are there fences that would buy thousands of stolen fluorescent yellow golf balls that say "Dr Pepper" on them? Maybe so. 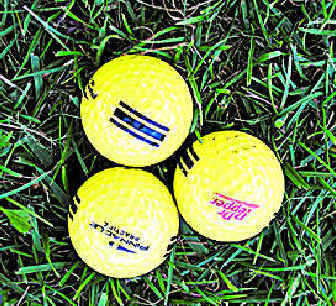 The course valued the lost balls at about $2,700, which would make it a felony if and when the thieves are captured, but that doesn’t mean they could actually sell them for anything close to that. Golf pro Jeff Johnson had another theory. Maybe, he said, "they are some really bad golfers who need some range balls to practice with — a lot." I’d figure out how much practice that would be but my brain already hurts. Anyone with information about the theft, such as someone who’s been asked if they want about five thousand beat-up yellow Dr Pepper golf balls at a really awesome price, is asked to call Bonner Springs police at 913-422-7800 or the Kansas City TIPS Hotline at 816-474-TIPS (474-8477). Stealing a Judge’s Gavel. Really?